The echo/sound test is an Ozeki Phone System XE extension capable of showing whether the phone connected to the PBX is working or not. It can also show you if the PBX is working. After creating an echo/sound test, it will receive a phone number. When you call that phone number, the echo/sound test service will be on the other end of the line. It can repeat your voice with a 'Direct echo' or a 'Record and play' function. 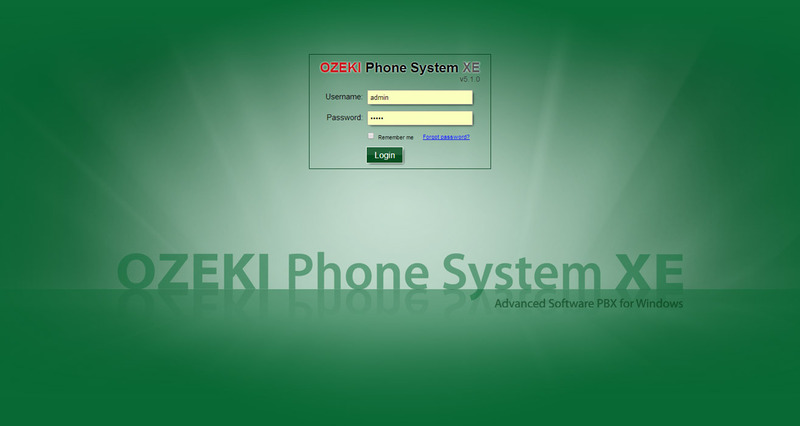 First of all login to the Ozeki Phone System XE using your username and password (Figure 1). Since the echo/sound test is an extension you need to add it. On the right side of the screen you will see a green box called Extensions. Click 'Add' (Figure 2). On the right half of the screen click on the 'Install' button next to the Echo/sound test label (Figure 3). You can determine on which number should the echo/sound test be available. You can also decide whether you wish to opt for 'Record and play' or 'Direct echo' (Figure 4). If you select for Direct echo, you will be able to listen to your own voice as you speak into the microphone. This way you can check the quality of the call and that of the connection. If you choose the Record and play option, when you speak into the microphone, it will be recorded. Then, you can listen to this recording to check its quality. After selecting the Record and play option, you will have access to Greeting message, Bye message and Duration settings. With these, you can determine what kind of text should be read before and after the given recording you made using the Text to Speech engine. You can even decide on the length of the recording using the Duration settings. Now your echo sound extension is up and running. If you follow this guide step-by-step, you will be able to check your connection and the quality of the phone line plain and simple.